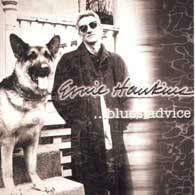 Pittsburgh's Ernie Hawkins is one of the most accomplished and impressive acoustic guitarists of our time. Schooled at the knee of Rev. Gary Davis (there is a great 1971 photo of Ernie escorting the reverend onstage at Carnegie Hall on the inside cover), he assays the music of Davis and a handful of other historic giants of the genre on this five-star collection. Like Roy Bookbinder, Duck Baker, Stefan Grossman and few others, Ernie Hawkins can cause a jaw to drop at 50 paces. His solo instrumental take on Skip James' "What Am I To Do," for instance, is delicate and intricate. The following "Will There Be Stars On My Grave," a traditional piece played with Davis' arrangement, is one of the most emotive pieces of guitar music I've heard in a long while. There are no John Hurt pieces in the collection, but his influence is heard equally throughout. While most of the collection is solo, Hawkins is joined to wonderful effect by Willie Try on harp for a pair of Skip James' pieces, "Hard Time Killin' Floor Blues" and "If You Haven't Any Hay, Get On Down That Road." The interplay is superb on both, and the two work their tandem sorcery on Hawkins' "Where The Mississippi Meets The Monongahela," which also sports the guitar work of Big Jack Johnson, as well as Willie McTell's "Cold Winter Day," and the traditional "Call Up China." Obviously Hawkins has no fear of diving into the canon. From Blind Blake's opening "Police Dog Blues" to the closing Son House "Down South When You Do Anything That's Wrong," with stops along the way at Rev. Gary Davis ("Penitentiary Blues," "Sampson And Delilah," with Rodger Montgomery's harmony vocals added and "Cocaine"), Ernie Hawkins proves why he belongs in the ranks of the greats. Where others have met the challenge with less than spectacular results, Hawkins is confidently competent throughout -- which is to say, he's just amazing. Whew! This review is copyright © 2001 by Mark E. Gallo, and Blues On Stage, all rights reserved. Copy, duplication or download prohibited without written permission. For permission to use this review please send an E-mail to Ray Stiles.